You are supposed to have basic knowledge in cartography. Decide where you will store your maps, waypoints, routes and other data. Run setup executable and follow the instructions. You will be asked about data path during the installation. Enter the full path to the directory. At this moment the program is searching for data (maps, waypoints, routes, etc.) in your data directory. It may take some time depends on data you have. Next starts will be faster. If you start Wanderer without any maps the screen will be empty. You will see a notice accordingly. Distribution package contains some sample maps for you reference. Please check our website to find out where to get maps. Current map is a map under the red crossing. Red crossing shows your current position. Current map location is saved upon exit and restored on next run. The program shows maps, waypoints (default state is off), routes (default state is off), current position in latitude/longitude (customizable display), GPS signal status, battery status, current time etc. Seamless mapping feature will work correctly if map calibration is correct and adjacent maps have the same MPP (Meters Per Pixel). If you convert maps by TopoMapia tool you can set one MPP to all maps. Map images will be scaled to required MPP. To zoom out or zoom in the current view use up and down keys accordingly (use joystick keys on pocket device). Scale range is 5%-200% with fixed values. 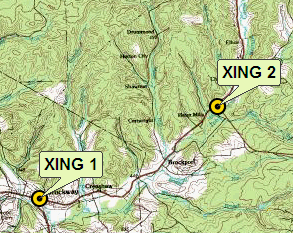 More than one map can be found for the given location. In this case in the upper-left (upper-right) corner small arrow will be shown. If you press the left/right arrow key accordingly (use joystick keys on pocket device) the current map will be changed to the map with the larger/lesser scale. To call the program menu use spacebar or enter keys on keyboard or click at the top of screen. To call the menu on mobile devices use joystick central button or tap the top of the screen. There are different ways to open maps in Wanderer: manually or automatically by switching GPS on. Select the map by entering location latitude/longitude. Manual map selection will switch GPS off. Select from the menu "maps/open by geo name". You have to download additiona data for the country(ies) of your interest to get it working. Name databases must be in data directory or its subdirectories. Select the country and object type to search. 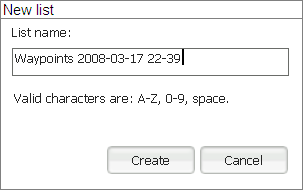 You have to enter at least 3 characters to search. Output list for the search results is limited. Try to specify more characters and repeat the search if you don't find required name. Search is limited by available maps boundaries. It means that if you search for the name, which location is outside of the area your maps is cover this name will be discarded from the results. Click "Go there" button if you found required place. Appropriate map will be opened. Choosing this menu item will open the list of available maps (found in your data directory). Wanderer shows maps available only in your data directory and its subdirectories. Click "Load" button to load the map and make it current. 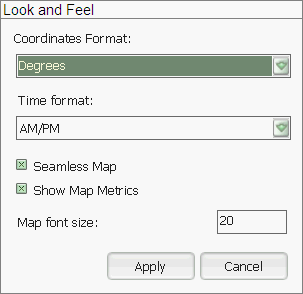 This menu item opens the dialog to open a map by entering location. 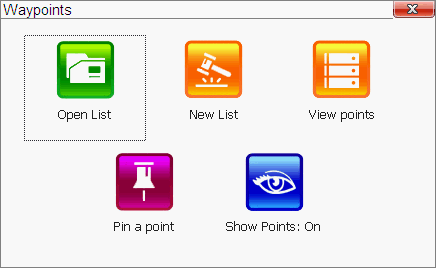 Please get acquainted with the section "Locations display and input". 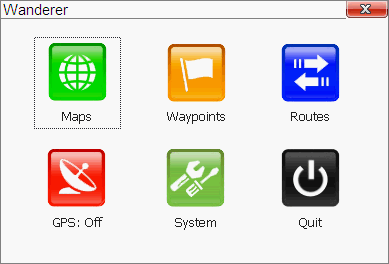 Use this menu to load waypoints list, add waypoints, show/hide waypoints on map. 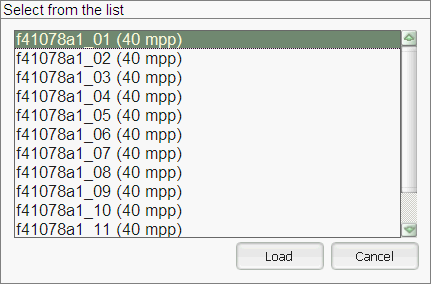 It loads waypoints list from a file. Wanderer shows available waypoints lists only in your data directory and its subdirectories. Select required list and click Load. Waypoints will be shown automatically after open. Select "New list". Enter the name and click "Create". Select this menu item to view waypoints. You will see the list, piece of appropriate map (if any) for selected waypoint and location coordinates. "Go There" will close the dialog and move your current location to the selected waypoint. Quick way to add waypoint - select Pin point menu item. New waypoint with current coordinated will be added to the opened waypoint list. You have an option to change coordinates befor saving. Current coordinates is the coordinates of red crossing in the center. 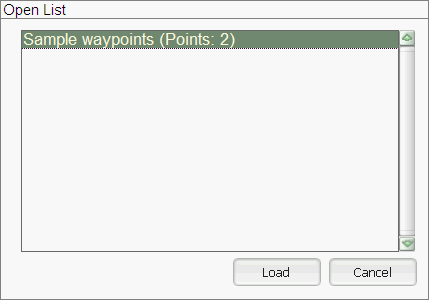 You have to create or open waypoints list before a point can be added. Enter desired point name (ex. Camp) and edit coordinates if necessary. Click "Save" to add the point to the current list. To show/hide waypoints on a map select menu item "Show Points: On/Off". You may load pre-created route and show/hide routes display on map. Use this menu item to load route. Wanderer looks for available routes only in your data directory and its subdirectories. Select required route and open it. It will be shown on the map automatically. There are no tools to create routes at this moment. To convert existing routes from other programs use free utilites FrontWay and NaviRoute. To show or hide routes display on the map select menu item "Show Routes: On/Off". On small scales waypoints names will be hidden and only waypoints icons will be shown. This menu item allows switch GPS on and off. Please check your GPS-reciever manual to be sure that it supports NMEA protocol. Be sure that external GPS-reciever is powered on. Check GPS-reciever parameters - see the secton below in this manual. Unregistered version has 5 minutes limitation on working with GPS (after 5 minutes GPS will be switched off). After GPS gets coordinates from satellites Wanderer will open appropriate map file and show your position on the map. Do not use Wanderer as a primary navigation source. Getting data from satellites will take some time, which depends on GPS model, your position, landscape and other factors. Wanderer shows your position, moving direction and velocity while you are moving. Remember about safety when driving. Do not try to manipulate with the program while driving. 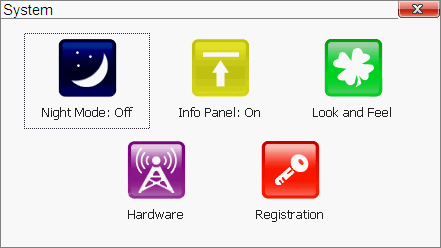 This menu allows to switch between day/night modes, show/hide information panel, some map parameters, set GPS hardware parameters as well as enter registration information. This mode is recommended for dark periods of time. It adjusts map colors and reduce eye tiredness while using in car. Information panel provides additional information about battery life, satellites signal quality, current map scale, time of day and current coordinates. You may adjust some parameters here for coordinates display and entering, time format, font size. Time format: 12 or 24 hours. Seamless map: if it is on Wanderer shows all visible cards with the same scale. Off state makes sense on slow notebooks and pocket devices. Show map metrics: shows the size of visible part of the map (in km). Map font size: font size for waypoints, routes, information panel. 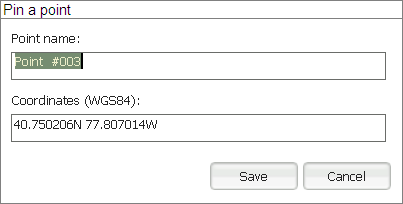 This menu item opens GPS-reciever parameters settings dialog. 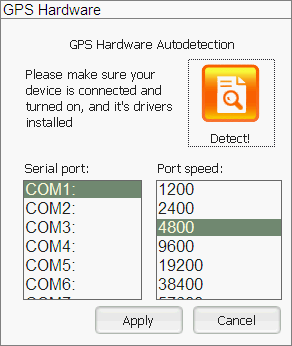 If you don't know exact settings for your GPS-reciever - try to use "Detect!" 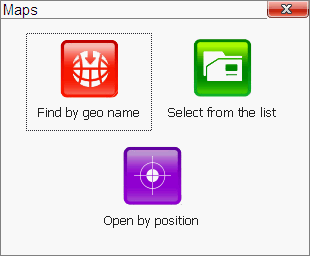 feature to search for available GPS devices. Please be sure that your GPS-reciever uses NMEA protocol to transmit data. Check, that GPS is powered on (for external devices). Check that you have all required GPS-reciever drivers installed (if required). Autodetection may take some time. To start autodetection click "Detect!". If the search is successful - you just have to save current settings. If the autodetection process failed - check manual for the GPS connection and/or try to enter settings manually. Enter your registration data, and click "Save". Keep your registration data in safe place - they are required to identify version of your software and provide support. Unregistered version has a limitation on GPS working time - 5 minutes. After 5 minutes it will be switched off. It is simple - select "Quit" from the menu. This version allows use maps, routes, waypoints from other wide known programs. It is available after data conversion. 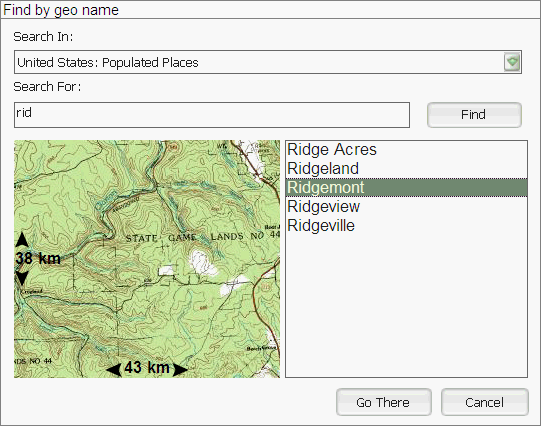 TopoMapia tool allows importing maps in OziExplorer and USGS GeoTiff formats. 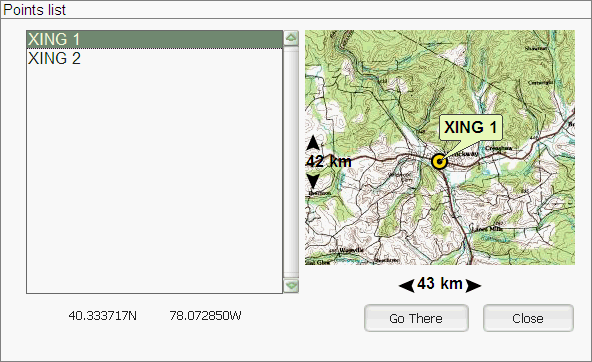 NaviPoint tool allows importing waypoints from .wpt format (Ozi Explorer). NaviRoute tool allows importing routes .rte format (Ozi Explorer). Support for other formats available upon request. You may calibrate almost any map image by using FrontMap tool. See details in FrontMap documentation. To create a route use FrontRoute tool. See details in FrontRoute documentation. 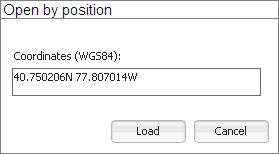 Any coordinates input and output along the program are in WGS84. WGS84 - World Geodetic System 1984. It uses worldwide geo-data basis. Wanderer has coordinates input sense feature, which allows you to enter coordinates in most suitable format - decimal degrees, degrees and decimal minutes, degrees minutes and seconds. Numbers divided by space. Version for PocketPC and othe Windows Mobile powered devices very similar to the desktop version. Onscreen keyboard will appear when text input is necessary. To show/hide onscreen keyboard tap Abc button in the top right corner. Preffered input method for Wanderer can be selected in Wanderer settings.